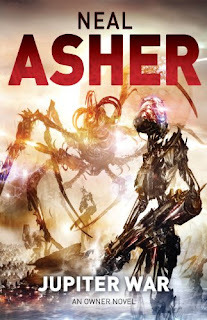 Jupiter War is out there! Well, as is always the case there are those getting their copies of my next book before the release date and enjoying a good gloat about it. Others are crying in the wilderness because it hasn't turned up yet. One person I know of has already read it, while another in South Africa is waiting for it to turn up on his Kobo. But Jupiter War is out there! Penny Royal I: Isobel ... reaching boredom threshold. 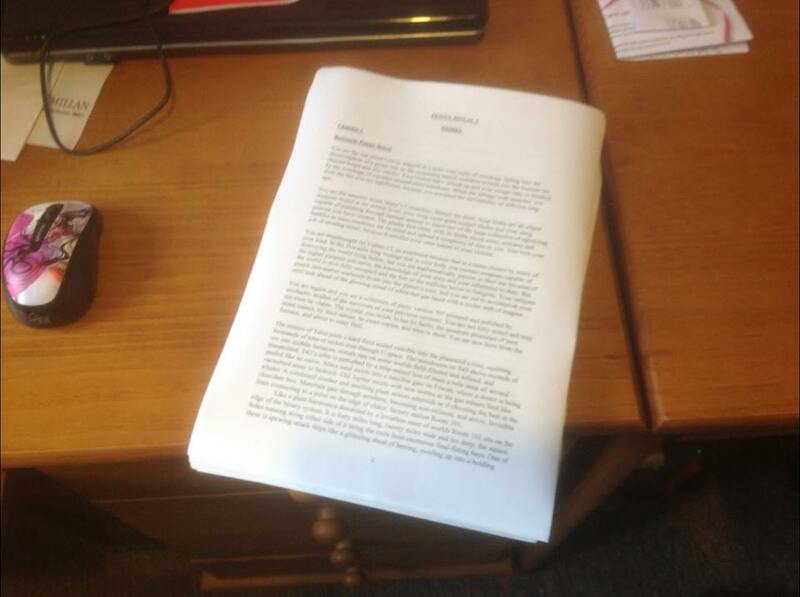 I’m steadily working through the printed out version of Penny Royal I: Isobel, but it is a bit of a grind. Certainly I’m finding mistakes but after just reading a few pages I start to lose concentration and find myself just reading instead of looking for errors. I can claim that this is due to various distractions in my life just lately, like my mother dying a week or so ago and Caroline having undergone a major operation and now slowly recovering here, but I have reached this stage in every book I’ve written. When does one send a book in to the publisher? It would be nice to say it is when you have ironed out every error, when it is perfect and polished and clear and exact. However, in my case, the reality is that it goes off to the publisher when the thought of further editing makes me feel a little ill, and when, while doing that further editing I find myself making alterations not so much to correct mistakes, but out of boredom. After I've emailed this book to Macmillan I think it will be time for me to take a break. Maybe I should just sit and read books for a week or two (when not spending some time clearing out my mother's house) maybe just watch some TV ... or, more likely, the work-ethic monkey on my back will start pinching my ear and I'll probably turn to editing the next book. SWOF: Why does the TPD favour tobacco? This brought me to a halt the moment I saw it and I was glad I had my camera in my bag. Somebody had obviously taken exception to a No-Smoking sign on a path leading into the grounds of Ipswich hospital and peeled off some of the paint. Not that these signs have any effect. I saw a guy in a wheelchair and another with his drip still attached outside one wing of the hospital chuffing away on cigarettes. Both didn't look in great condition and I had to wonder if the phrase, 'That will kill you,' would have received a hollow laugh in reply. So what sort of funny line can go with this? It wasn't Sir Walter Rayleigh who introduced tobacco to the world! So who's going to tell him to stub it out? Of course we could get into denormalization territory with something about how only dinosaurs smoke. Or maybe into one of today's manufactured panics: Now we know it wasn't an asteroid! I mean seriously, no smoking for any stegosaurus beyond this point? I saw a funny thing on the way to Ipswich hospital the other day - a demonstration that if you look for them coincidences are all around. Which of course is a way to lead into this: Jupiter War is out on the 26th! New arrival from Macmillan yesterday, and very nice they look too. 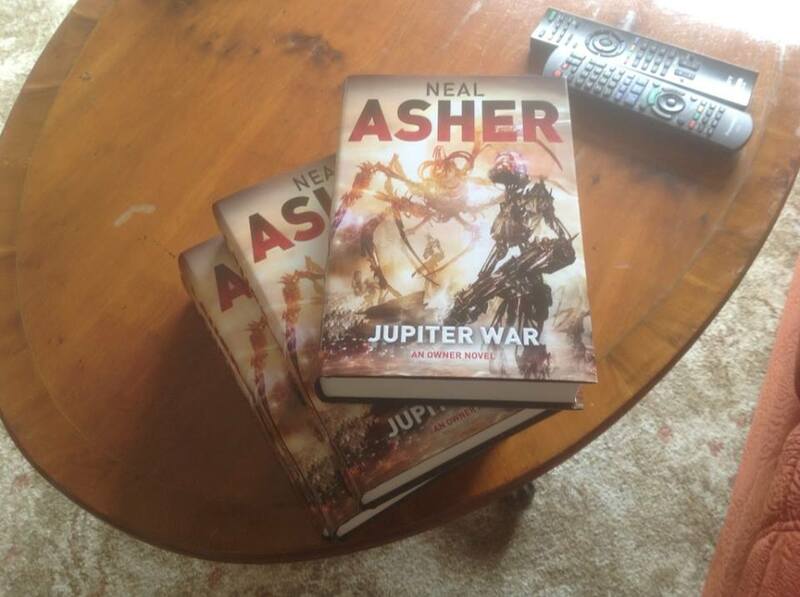 Don’t forget that Jupiter War is available on the 26th. I see that it’s already being well pre-ordered and that the kindle version is at number2 on New & Future Releases (science fiction) on Amazon (that bugger Reynolds having the number one spot). 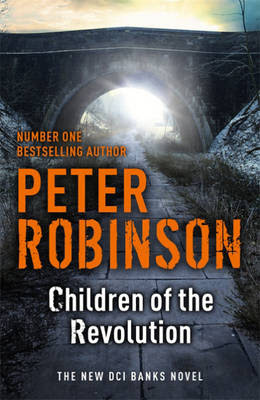 Right, off to Colchester today where Caroline is going to get some Peter Robinson books signed – he’s doing a signing of his new book Children of the Revolution in Waterstones. After that we head for Ipswich where Caroline is being admitted to the hospital for surgery, but that’s not something I want to go on about here. "It really is a wolf," said Peter. Scientists in the US have presented one of the most dramatic forecasts yet for the disappearance of Arctic sea ice. Their latest modelling studies indicate northern polar waters could be ice-free in summers within just 5-6 years. You have to chuckle ... or maybe scream a bit. Something everyone really needs to realise when reading 'science' reports and studying graphs. How much of a tilt there is on any line on the graph - how severe it looks - is utterly dependent on the numbers used and their spacing up the sides or along the bottom or top. In the previous post I was talking about the various health effects I’ve experienced since stopping smoking and starting vaping. Here’s another odd one: I grew up in a household where there were two or three cats at any time and have always liked them. In recent years, however, I started to notice that I was growing allergic to them. Even just stroking one briefly resulted in my face starting to itch and turn blotchy. Any longer contact with a cat and quite often, afterwards, I would have to change my shirt and wash my face to dispel the itchiness. This weekend one of our neighbour’s cats decided it would like to stay for a visit. It explored the house, jumped onto the sofa and sprawled there, was all put climbing into my lap when I stroked it. This continued for a while and then suddenly I noticed I was scattered with cat hairs and simply wasn’t getting an allergic reaction at all. I guess this is down to the mentioned improvement in my skin and perhaps the lack of holes and sensitizing damage, along with a general overall improvement in health that basically gives me a greater resistance to stuff. Today should be a day of celebration since it has been 50 days since I last smoked a cigarette (I guess I’ll have a gin & tonic tonight for a change ho ho). Casting back over my previous blog posts I’ve decided to sum up some of my thoughts and on things I’ve learned and on the effects upon me. Let’s start with health since that is the main reason for quitting the weed. In a previous post a mentioned how horrified I was to count the number of asthma inhalers I had accumulated in my bedside drawer. I had so many because, obviously, I needed them: I was taking a few puffs when going to bed, sometimes in the night because of breathing difficulties, sometimes in the morning too. Very occasionally I needed them during the day. The sheer number I have is due to me shuttling back and forth between here and Crete over the last six years. Here those inhalers cost a prescription charge of about £8 and first require a visit to the doctor to get them prescribed. Of course I never wanted to go to the doctor because he or she would inevitably ask me about my smoking… Anyway, out in Crete they can be bought for about €3 over the counter from the pharmacist so, of course, I was buying them out there and bringing them back, and never remembering how many I had here when doing the buying. Now I don’t use them. During the first couple of weeks of quitting I took the occasional pull, but since then I haven’t even had reason to think about the things. My skin has improved. Many years back I suffered from acne rosacea and for many years took pills to control it. As, over the years, these pills lost their effectiveness, this rosacea transformed into some form of dermatitis, the spottiness moving out from my nose to my cheeks and where my sideburns would be if I had any. I also had spots on my scalp, shoulders and upper back. These always turned itchy in the middle of the night, and I would end up scratching them before awake enough to stop myself. It was so bad, in fact, that Caroline bought dark material pillow-cases just for me to disguise the blood. In the past I’ve gone through various phases thinking it was the sun that aggravated this, it was skin mites or it was my drinking, or that I needed to take this vitamin or that. Now, having given up smoking for 50 days, I don’t have a single itchy spot on my face or my scalp. All I have is a persistent one on one shoulder, which even now seems to be healing up. In fact the skin on my face now feels tough – like a won’t be able to inadvertently put my nail through it. Oh, and on the subject of nails: my fingernails no longer look as dry and dull. My general health has also improved. I can think of no better way of putting it than that I feel younger. I don’t feel sluggish all the time any more. I’m not perpetually tired and don’t look upon the next job I have to do with a sinking sensation and the urge to avoid it. However, I have to add that I do have my moments. My sleep patterns still haven’t properly stabilized and this does lead to me getting sand-bagged by Morpheus at odd times. Then again, because I wasn’t sleeping I got hold of some Nytol, Sominex and some Melatonin. These, I’ve now decided, are worse than insomnia. Yes they’ll help you to get to sleep, but they’ll also help you feel sleepy throughout the following day. On rereading my previous posts I realise that I posted a lot during the initial weeks and there talked mostly about the NRT – the number of posts I was doing waning as I took up with the electronic cigarette. The reason for this is simple: my concentration was back and I was able to get on with some editing. Therefore, though I have written some, I haven’t written enough about my e-cig: my Kanger protank and Evod battery. Yes, the nicotine gum, the inhalator and the microtabs helped, but all these did was replace missing nicotine and, as all smokers are aware, smoking is not only about the nicotine. Well, maybe I could have quitted cigarettes just using that conventional NRT, but it is the e-cig that has made it easy. In fact it has made it so easy that I hesitate here over the words ‘I’ve quit smoking’. This hesitation, I guess, all comes down to some erroneous associations that really need to be quashed. The e-cig crowd are getting there with the new words vapers, vaping, a vape etc, but the description that really needs to be changed is ‘electronic cigarette’. Perhaps I should make a point from now on of describing the thing I use as a vaporiser. Another association that needs to be lost is that of the addiction to nicotine with smoking itself. In the minds of many, as I have discovered, nicotine is A BAD THING. Well yes it was, when the only way you could get it into your system was by burning tobacco leaves. 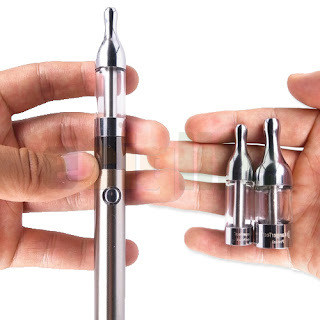 These vaporisers have now changed the paradigm and, to finish on an sfnal note, all the anti-smokers out there who want to ban these devices seem to be suffering from a form of future shock. A number of months back my wife was diagnosed with a serious complaint that requires major surgery and, this tending to focus one on matters of health, we both decided it was time to give up smoking. However, having made numerous attempts in the past and simply failing, we weren’t optimistic. Some friends, who had given up a few years before, handed over their stash of NRT including patches, gum, microtabs, inhalators and some electronic cigarettes. All of these worked to some degree but the e-cig was the most effective, even though the ones we had were a few years old and malfunctioning. We then, to our surprise, found them for sale in Tesco and bought a Vapestick each. These, with their ‘cartomizers’ and more modern design were even better. Better still, thereafter, was an e-cig with a small glass tank that can take various flavours of e-liquid. It was the moment I started using one of these that I had an epiphany, realising that I would never ever again smoke a cigarette. 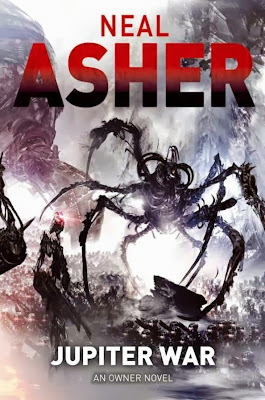 Incidentally, since I’m a known SF writer (ask David Davis) who also blogs a lot, this has led to six of my fans finally taking the plunge and giving up smoking using the same method. It is now the case that even if I cannot give up ‘vaping’ my chances of dying from all those smoking-related maladies have just dropped through the floor. These devices are massively harm-reducing. Ignore all this mealy-mouthed nonsense that starts with ‘but we don’t know enough’. We know that a ‘vaper’ breathes in nicotine, a vaporising substance found in asthma inhalers, and water. Nicotine is certainly addictive, but is no more harmful than caffeine. Yes, some further supposedly harmful substances have been found, but no more than are found in conventional NRT – trace amounts – and of course the merest fraction of a per cent of two or three of the thousands of chemicals and 60 or so known carcinogens in real cigarettes. So, imagine my surprise and horror to learn that there are people who want to ban these devices, and that bans have in fact already been introduced on some trains and in some pub chains. Imagine how annoying it is for me to discover that legislation is being introduced, much to the delight of drug and cigarette companies, that will kill innovation in this new industry, make these devices difficult to sell, impose limits on the strength and flavours of e-liquids and, in essence will drive many ‘vapers’ back to smoking; many of the 1.3 million people now using e-cigs in Britain today. This is madness. This reveals that activists at the likes of ASH are more concerned with activism itself rather than the purported reason for it. This reveals that such is the hatred of anti-smokers that they would rather people died than use something that looks like a cigarette. This leads to complete Twilight Zone situations like one recently, when an NHS quit-smoking manager was complaining about a lack clients, because they were using e-cigs. Now, as my MP, what are you going to do about this? Here is something you can get behind that will actually save lives. In Zero Point we follow the story of Serene Galahad who is trying to reform the Committee, albeit in a radicalized manner. On the other hand the Mars Colony is trying to continue it's steps toward the independence from Earth while the events about Argus Station are continuing to unfold at it's hurling toward red planet. The character of Serene Galahad is fantastic. At the same time fiercely intelligent and arch-typically evil, Serena is frightening reminder what might happen if someone like that ended up holding the reins of power in real life. By the end of the book, everything is set up for the final showdown. 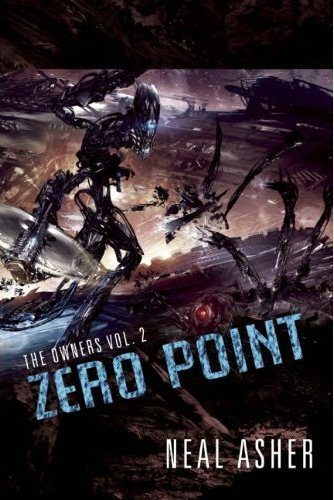 Even though The Departure was quite bleak book for Neal, Zero Point pushes the darkness one notch further through its exploration of the missuses of technology. You'll literary squirm at the implications but there is simply no light at the end of the tunnel. Neal Asher has once again struck gold with Zero Point and I can't wait for Jupiter War to see what he'll come up with next.